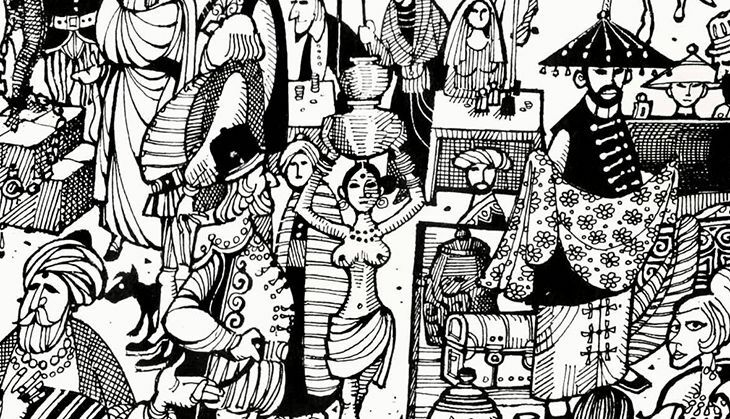 Even on the off chance that you don't know Mario Miranda's name, you've probably seen his work. On the walls of Mumbai's iconic Cafe Mondegar. At Goa's Madgaon station. In Panjim's crowded vegetable market. Miranda's work may have graced the pages of the top newspapers of this country but he was nothing if not about the everyday. 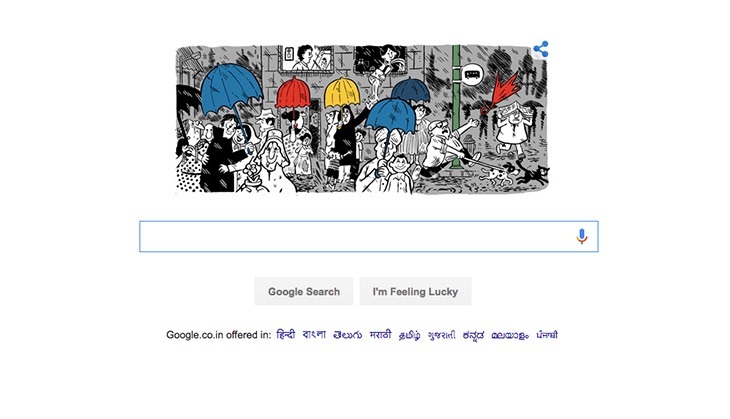 Today, on his 90th birthday, Google is honouring the cartoonist who captured the soul of India with style, humour and flourish. Miranda's bold strokes were at once extravagant and spectacular, bursting with detail and perspective, making one see facets of our own lives we had been blind to. Aaron Renier, who specialises in drawing crowds, was commissioned to draw the Google doodle. Reiner's sketch details a rain scene at a Mumbai bus stop - much like Miranda's. People huddling under umbrellas, shielding themselves with anything they can find handy, the tiny space a quirky crush of people and dogs and cats. When Google asked Aaron Renier to make the Doodle, his first reaction was "why me?" "I felt extremely honored, but my first reaction was - 'why me?' But as a freelance artist you don't really ask that question, you just say 'thank you'," Renier told Catch News. "I was a little nervous knowing the image would be shown to people more familiar with his work. Some of my earlier sketches were more me, trying to show his energy. But I'm glad I was asked to do a more straightforward likeness. I did think I could make it work." To Renier, Miranda's work feels like Pieter Bruegel through the pen of Sergio Aragones. "I wasn't that familiar with his work before working on the project, but I've grown to really love his work, and all his styles. He makes me want to weave more stories into singular scenes. I hope that is what I take from this experience." Renier spent a few days on and off coming up with ideas, and about a day to make the final drawing. The final drawing is physically much larger than what we see on our screens. "I picked the one that spoke to me the most. I prefer his more stripped down style. I honestly wish mine was a little more stripped down, like one of his cafe murals." "I approached Mario's work by pretending I was drawing with him," Renier wrote on the Google Doodle page. "I chose his most popular style, very flat with criss-crossing interactions." In this homage to Miranda, there is a rich litany of people, each unique in their perspective. "That is what I liked most about his work," Renier explains, "trying to pick out who knows who, who's watching who, who's annoyed by who, who's enamored by who. Hopefully people will see something of (Miranda's) spirit in it." Ad man Rahul da Cunha, who has been capturing the mood of India for decades with his Amul advertisements, is a huge Mario Miranda fan. "Mario was without a doubt our greatest-ever cartoonist - more than a cartoonist he was a social observer," says da Cunha. "Mario could communicate the foibles and idiosyncrasies of communities and human behaviour with his sketch pen and paint brush." However, what da Cunha liked best was the way Miranda captured the Goan way of life and its distinct characters. "I loved his work in France and New York too," says da Cunha. Artist Orijit Sen is another Miranda fan. "I love the powerful sketches, textures, patterns, the distinct feel of Mario's works," says Sen.
His favourites, like da Cunha, are the "powerful, beautiful, strong and evocative scenes from Goa". "The timelessness and the larger-than-lifeness are the hallmark of Miranda's work." Sen admits that some of his own art - which is multidimensional and multilayered may have been subconsciously inspired by Miranda's body of work. In The Life of Mario 1951, Miranda tells the world how he became an artist. In this diary he records all the goings on in his family and his family of pets - a fact that obviously didn't escape Renier's eye. Little wonder then that after soaking in every detail, his tribute to the great cartoonist is a perfect 10. And while Miranda's work was so evocative it almost feels alive, this fabulous animation based on his work is the most vivid tribute of all.